The walk is not difficult although the going can be hard in places and the pathways can be a little uneven and rocky. Leave at least 3 hours walking time for the round trip. On the map above follow the deep blue, then pink, then blue routs going east to west. 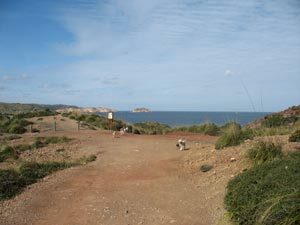 Starting in the car park on the Cap de Cavalleria road, head north along the pathway to Cavalleria beach for 0.6 Km. 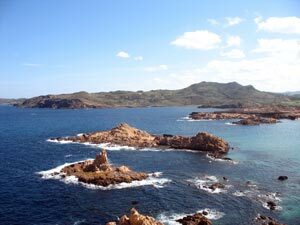 Walk along the beach for approximately 280 meters un till you reach the natural break behind the beach. At this point leave the beach and head west up the hill following the Cami de Cavalls wooden marker posts. The Cami de Cavalls path stays close to the sea for most of it's length and there are one or two quite steep hill to cross. The wooden marker along this section of the cami de Cavalls can be easy to miss so keep looking out for them. 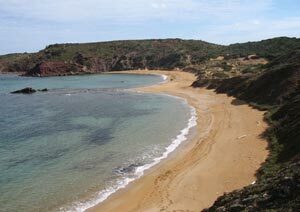 Between Cavalleria beach and Binimel-la [3 Km] you pass a number of small picturesque beaches, where on a hot day you can have a cooling swim. Follow Binimel-la beach round and take the well marked path to the west, after passing a rocky beach you come over the hill and onto the first of Cala Pregonda's two golden beaches [1.1 Km] To reach the second beach take the path to the west and north up the hill towards the wall [150 meters] at the top there is a gate through it. From here follow the road [300 meters] dropping down to the beach. Good comfortable shoes, sun hat, sun cream, bathing costume, a picnic and a large bottle of water. 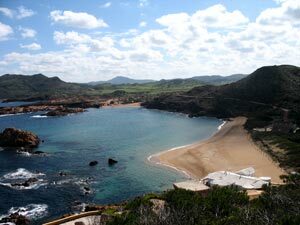 Cavalleria a golden magnificent beach. Menorca's northern coast Cami de Cavalls.